The information in this mailing relates only to ICD-11, the forthcoming revision of ICD-10 that is scheduled for pilot implementation in 2015. It does not apply to the forthcoming US specific Clinical Modification of ICD-10, known as “ICD-10-CM”, scheduled for implementation in October 2013, or to Clinical Modifications of ICD-10 already in use. Caveat (updated 18 September 2011): The screenshots below were a “snapshot” of the ICD-11 Alpha Browser as it had stood on May 17 and 19, 2011. The ICD-11 Alpha Browser is a work in progress and is updated by ICD Revision personnel on a daily basis. 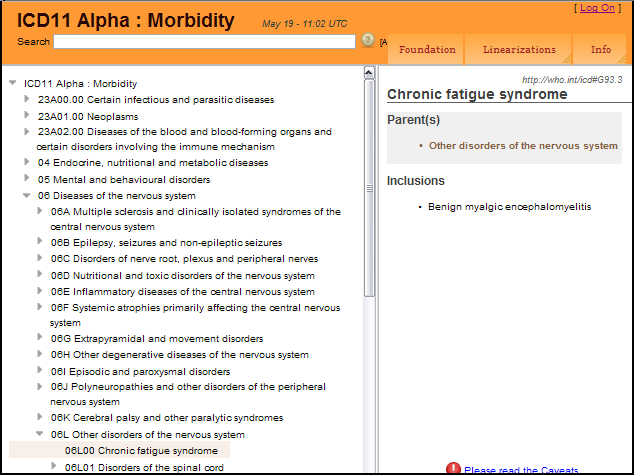 Information visible in the Alpha Browser is incomplete, will have changed since May 17, may be in a state of flux and may contain errors and omissions; the codes and temporary “Sorting labels” assigned to ICD parent classes and categories are subject to change as work on the draft progresses and as chapters are reorganized. Note that the screenshots below no longer reflect what can be seen in the draft, as it currently stands in September 2011. Not all ICD-11 category terms and the data associated with them (which is in the process of being populated according to 13 common ICD-11 Content Model fields, that include Definitions, Inclusions, Exclusions, Causal Mechanisms and other parameters that will be used to describe ICD-11 entities) display in this version of the Alpha Browser platform. A separate, more layered electronic drafting platform is being used by the various ICD Revision Topic Advisory Group (TAG) managers and their workgroup members, accessible only to ICD Revision TAG personnel via a password protected log in. 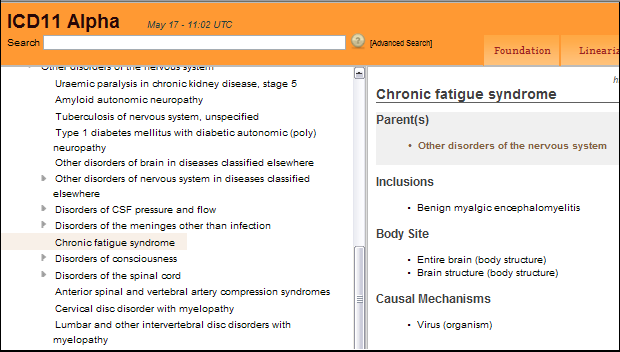 The multi author electronic platform which the Revision TAGs are working on displays Content Model fields that are not currently viewable by the public, though for some ICD categories, Definitions are now displaying in the public version, as the development of some chapters of the ICD-11 Alpha Browser is more advanced than others. In the meantime, the version of the Alpha Draft currently visible to the public comes with WHO caveats and should not be relied upon and it does not reflect the screenshots below, as they had stood in May, this year. As soon as the new public platform is released, I will update, at the moment there is insufficient information to reliably determine proposals and I am seeing misreporting and outdated information being discussed on some forums. For example, in June to November 2010, the iCAT Alpha Draft recorded a change in hierarchy for PVFS because its parent class “G93 Other disorders of brain” is removed, with ICD Title “Gj92 Chronic fatigue syndrome” listed as a child category of parent class, “GN Other disorders of the nervous system” (see this post for screenshots as they stood at that date). But by May 2011, the “Sorting labels” had been revised and the public version of the alpha draft displayed “06L Other disorders of the nervous system” > “06L00 Chronic fatigue syndrome”. However, the 06L00 code has subsequently been reassigned to parent class “Disorders of autonomic nervous system”, and parent class, “[G93] Other disorders of brain” (an ICD-10 legacy parent class which had previously been proposed to be removed or retired) has since reappeared as a parent class at “06L02”. (for which no rationale or “Discussion Note” is evident in the public version), together with a long list of other Chapter 6 categories listed under Special tabulation lists for mortality and morbidity. I would advise against attempting to determine ICD-11 proposals based on the status of the information as it currently displays, the ambiguities, the lack of visible “Discussion Notes” which explain changes (which had been visible in the iCAT platform, last year) and given that input and organization of data on the multi editor platform is subject to daily revision by numerous ICD Revision personnel, is therefore in a state of flux and may contain technical errors and omissions due to software glitches and human error in data entry and operation of a complex electronic platform. I wrote to WHO’s Sarah Cottler in September 2011 requesting clarifications. No response was received. In May, I reported that the revision of ICD-10 and development of ICD-11 is running about a year behind targets for the population of content and software development and that the ICD-11 Timeline for Alpha and Beta drafting has been adjusted . In order to meet its revised schedule, the technical work on ICD-11 will need to be completed by 2013, the year the APA’s DSM-5 is slated for publication. In November 2010, the iCAT platform through which ICD-11 was being drafted was taken out of the public domain. In May, this year, an ICD-11 Alpha browser was released for public viewing , with a number of caveats . This most recently published Alpha platform does not include many of the “Content Model” parameters, for example, no draft “Definitions” are included and neither are the “Discussion Notes” and “Change Histories” that had been viewable in the iCAT, as it stood last June to November. You can see screenshots of the June to November 2010 version of the iCAT in this post . see this post  or pull up the Alpha Browser pages, here . As you’ll see, ICD-10 Chapter VI (6) is undergoing reorganization and the parent class “G93 Other disorders of brain” under which “Postviral fatigue syndrome”, “Benign myalgic encephalomyelitis” and many other ICD-10 categories had sat is proposed to be removed. A change of hierarchy between “Postviral fatigue syndrome” and “Chronic fatigue sydrome” is recorded in a “Change History” note. Chapter 6 categories for ICD-11 are currently assigned the codes 06A thru 06L02. It is not known what codes will eventually be assigned to the categories within ICD-11 Chapter 6. As you’ll see from the screenshots, “06L00 Chronic fatigue syndrome” is proposed to be classified under “06L Other disorders of the nervous system”, with “Benign myalgic encephalomyelitis” specified as an Inclusion term to “06L00 Chronic fatigue syndrome”. Relationships between Inclusion terms are not specified within ICD-10, but they will be specified within ICD-11. The Revision Steering Group (RSG) and the various ICD Revision Topic Advisory Groups (TAGs) and their external reviewers for content and proposals are using a more layered version of the platform on which they are undertaking the ongoing drafting process; their platform is currently accessible only to WHO, ICD Revision and IT technicians. The public version of the ICD-11 Alpha Browser, which is being updated daily, is currently open for public viewing only – not for commenting on. But in July, ICD Revision is planning to open up the Alpha Browser for one year for public commenting and consultations. The WHO will be engaging with stakeholders who express an interest in participating in the ICD revision process. The drafting browsers will be open all year round, subject to continuous daily updates and open to all interested stakeholders – Health Care Providers, Information Managers etc. Proposals and feedback will be subject to structured peer review by the Topic Advisory Groups. For more information on how stakeholder participation is being projected see presentation slides in these reports on my site  . It’s currently unclear which classes of stakeholder might be called upon to participate, and to what extent, during the Alpha drafting stage. WHO wants to know if you are interested in being involved in the ICD Revision. We will contact you as certain features are opened to the public. What is your clinical profession? I will check the form again, once the Alpha draft has been opened up for public comment, currently scheduled for July. It is anticipated that an Alpha browser using different software from that currently in use may be released in July. I will update when the browser is opened up for public comment. The WHO’s, Dr Bedhiran Üstün, describes ICD-10 as a “laundry list”. One of the most significant differences between ICD-10 and the forthcoming ICD-11 will be the “Content Model”. The content model is a structured framework that captures the knowledge that underpins the definition of an ICD entity. • Each ICD entity can be seen from different dimensions or “parameters”. E.g. there are currently 13 defined main parameters in the content model to describe a category in ICD (see below). For more information on the application of the “Content Model” see document . There are no definitions inlcuded in any volume of ICD-10 for “Postviral fatigue syndrome”, “Benign myalgic encephalomyelitis” or “Chronic fatigue syndrome”. WHO has never set out what it understands by these terms nor has it specified what ICD-10 understands the relationships between these three terms to be (see page: https://dxrevisionwatch.wordpress.com/icd-11-me-cfs/) but there will be definitions in ICD-11 and the relationships between Inclusion terms will be specified.